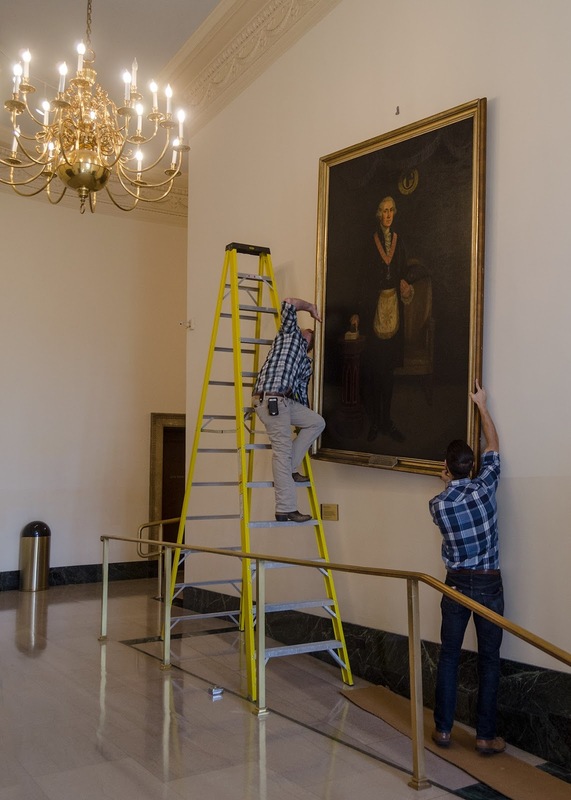 On Thursday this past week, the George Washington National Masonic Memorial in Alexandria proudly reinstalled a famous Masonic portrait of Washington, dressed in the regalia of Worshipful Master of Virginia's Alexandria-Washington Lodge 22. The Memorial recently undertook the task of having the original painting restored, and it now hangs near the Memorial's South Lodge Room. This evening - Sunday, November 4th, 2018 - marks the 266th anniversary of the initiation of then 20 year-old George Washington into the Lodge at Fredericksburg, Virginia in 1752. If this portrait looks familiar to many of you, it should. The portrait was commissioned in 1931 by Freemason and U.S. Congressman Sol Bloom for the George Washington Bicentennial Commission, and painted by artist Hattie Elizabeth Burdette (1875-1955). It depicts Washington presiding as Master of Alexandria-Washington Lodge No. 22, gavel in hand. If not the most famous image of Washington as a Freemason, it's arguably the most widely circulated one that is seen regularly in lodges all across the United States. Yet, it was commissioned by a Congressional committee and paid for by the government, not Masons. Imagine such a proposal today. New York Congressman Sol Bloom, director of [the Memorial] and a member of New York's Pacific Lodge No. 233, took pride in his agency's insistence on "realism." In consultation with F. Walter Mueller, a member of Century Lodge No. 100 in South Orange, New Jersey, Bloom reviewed many Masonic portraits of Washington before rejecting them all as inaccurate. He then hired Burdette to- create a portrait in which the figure was based upon Houdon's statue of Washington while the overall work incorporated the relics maintained by Alexandria-Washington Lodge No. 22... As well as appearing repeatedly both in the Masonic press and in publications of the Washington Bicentennial Commission, more than fifteen hundred photolithographic reproductions of Burdette's painting were distributed by congressmen to Masonic organizations throughout the United States. 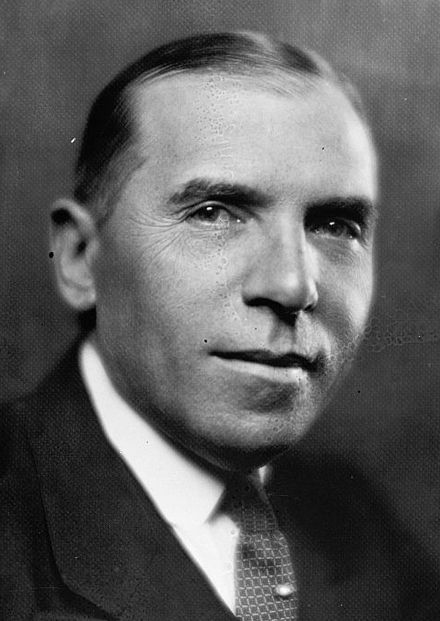 Brother Sol Bloom represented the 20th Congressional District (Manhattan's west side) in the House of Representatives, serving fourteen terms from 1923 until his death in 1949. During the critical years leading up to and through the end of World War II, he was Chairman of the House Committee on Foreign Affairs, and he later went on to become one of the first signers of the United Nations charter. Prior to his congressional career, he had been both a newspaper and music publisher. He also understood showmanship. Early in life he was a theatrical and boxing manager, and he had been the creator of the Midway of the famous Chicago Columbian Exhibition in 1893. In 1931, Bloom was named both chairman of the Congressional George Washington Bicentennial Commission and the director of the George Washington National Masonic Memorial's Bicentennial Committee, commemorating the 200th anniversary of George Washington's birth the following year. On that date, the new Masonic Memorial towering above Alexandria would be dedicated and opened to the public. Bloom requested eight Washington D.C. area artists to each create a poster which would be used to promote the official government-sponsored national celebration of Washington's birthday in 1932. Artist Hattie E. Burdette asked permission of Alexandria-Washington Lodge 22 to use their lodge room and Washington's Masonic gavel, sash, Past Master's jewel, his chair, and other items to depict in her painting. 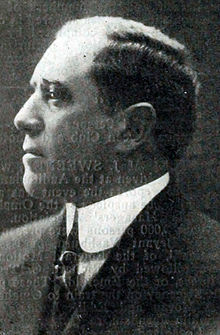 Her model was Teft Johnson (photo), an actor who portrayed the role of Washington in several historical plays under the direction of famed Broadway producer David Belasco. Of all the posters submitted, Burdette's was selected by the Commission to advertise the Memorial's dedication. On November 29, 1931, Congress and the National Bicentennial Commission decided that second week of May in 1932 would be set aside as Masonic Week. Consequently, May 12th would be the official opening and dedication of the George Washington Masonic National Memorial. Invitations to this gala event were sent to thousands of American citizens and to regular Freemasons around the world. 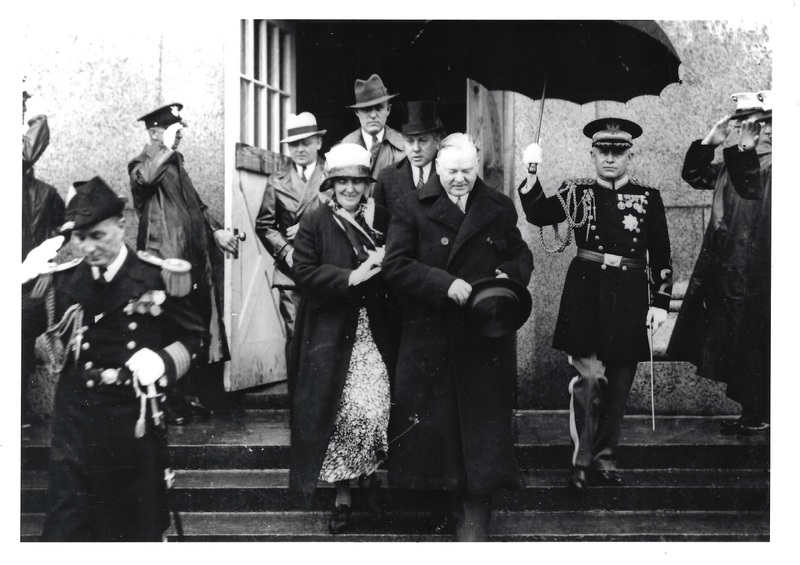 Although not a Mason himself, President Herbert Hoover and the First Lady were among the first to accept the invitation. 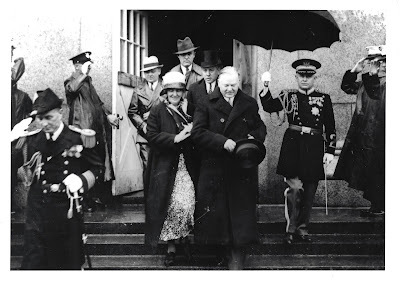 Others included every member of Congress, the Justices of the Supreme Court and members of President Hoover’s cabinet, along with all 49 of the Grand Masters of the U.S. The mayor of Alexandria, the governor of Virginia, and many other government, military, religious and civic leaders joined the celebration. As bad luck would have it, a torrential five-day downpour nearly ruined the ceremony - 50,000 attendees and onlookers had been expected and planned for, but the rain and flooding kept all but 1,500 from climbing the long driveway and attending at the Memorial itself. Bleachers outside sat wet and empty as reportedly hundreds of onlookers watched from the bottom of Shooters Hill safe and dry, huddled in railroad coaches at the Alexandria train station. Those who could manage to get inside the Memorial jammed into the 400 seat auditorium for the various speeches, far exceeding the Fire Marshal's directives. On September 17, 1932 Teft Johnson again portrayed Washington for a reenactment of the President laying the cornerstone of the United States Capitol with full Masonic ceremony. The cornerstone ceremony reenactment was filmed by the Bicentennial Commission. I am told with as much confidence as is possible that reproductions of Hattie Burdette's painting were circulated to every U.S. lodge possessing a charter in 1932, and that even today, every lodge in Virginia still has one hanging in its building. The original hung in the U.S. Capitol throughout 1932, and was then gifted to the George Washington National Masonic Memorial when the year was over. And to come full circle, the historic Bible upon which young Brother George placed his hands that evening in Fredericksburg 266 years ago when he took his obligation as an Entered Apprentice is still preserved by Fredericksburg Lodge No. 4. The lodge has recently started a restoration fund to have the fragile book properly curated for future generations. We were honored to have it here in Indiana for our Grand Lodge Bicentennial and the Conference of Grand Masters this year. 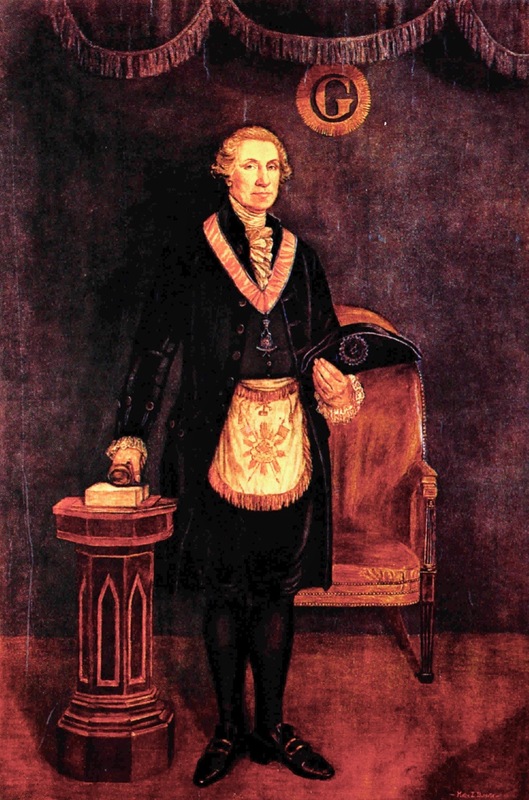 I have an oleograph (earlier than lithographs)of the George Washington in Masonic regalia by Hattie E Burdette. Apparently in 1932 for the Bicentennial, the same year as the painting, a number of oleograhs were made and distributed to Masonic Lodges in the eastern USA. The oleograph that I have came to Arizona 20 years ago with a New York Mason.